I spend an hour or so each day reading the new posts shared in the blogging world from my favourite food, lifestyle and travel bloggers. It's that nice little part of the day where I can have a little time to myself to relax and gain inspiration from the lovely bloggers out there. I've recently seen posts on a few blogs about 'the little things' in life and what makes people tick; this got me thinking, why not do 'the little things' as a weekly feature. You all know by now I like to keep my posts positive as much as possible as it is very easy to be sucked into th negativity of the world. I can be an extremely negative person and it's nice to reflect on the goings on in my week that give me a reason to smile. 1. FaceTime - I don't like to admit being too reliant on technology but I most definitely am; especially my apple products. Having FaceTime has been a real saving grace while I have been away. I have been incredibly homesick since arriving in Melbourne (not as much now though!) so being able to video call peoples each day has made me feel so much better. 2. My Mum - my best friend. My Mum is possibly one of the best people you could ever meet, maybe I'm biased because she is my Mum but she's truly fantastic. We speak everyday and always have done since I left for university. Being on the other side of the world from her, and my dad too, is probably one of the hardest things I've had to go through but having our daily calls makes me feel much closer than I am. 3. Christmas decorations - the Australians definitely don't go all out on Christmas like the English. The weather is so different over here so I can understand their Christmas of going to the beach, seafood lunch and the excitement over summer. That said, more and more places are popping their decorations up and a few menus are sneaking mulled cider on there. After all, it's not Christmas without something mulled. 4. Finding my bearings - I can now happily navigate my way around Melbourne city. I understand the tram routes, I can work out where I'm going without a map now AND I'm so happy about this. 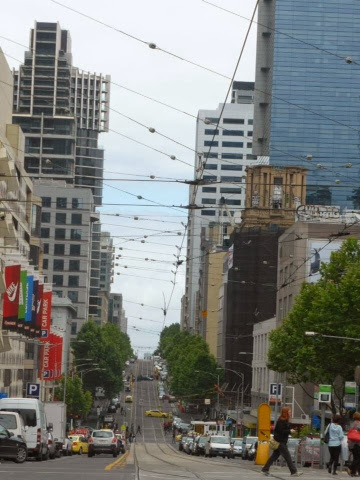 Melbourne is a fantastic city and I definitely want to come back here before I return to England. 5. Sending cards home - last week I went to Typo (my favourite new discovery, with Kikki K) to bug my Christmas cards. This was VERY organised for me this year but I was entirely sure when last post to the UK would be. After three or four days my cards had arrived and I was being sent pictures of everybody with their cards. This little form of communication warms my heart. With all the technology available these days, sending something via snail mail is much more heartfelt.